What makes the video so strange is just how dramatically the tone changes. It begins as just a dude in his 2013 Jeep Wrangler filming himself on some dirt roads in the eastern Oregon desert. He stops by his favorite western-style general store, cruises down a side road to check out an abandoned homestead, discusses the local obsidian rocks and how native Americans used to use them to make tools, and he even talks about how he’s been on a coconut milk kick lately. 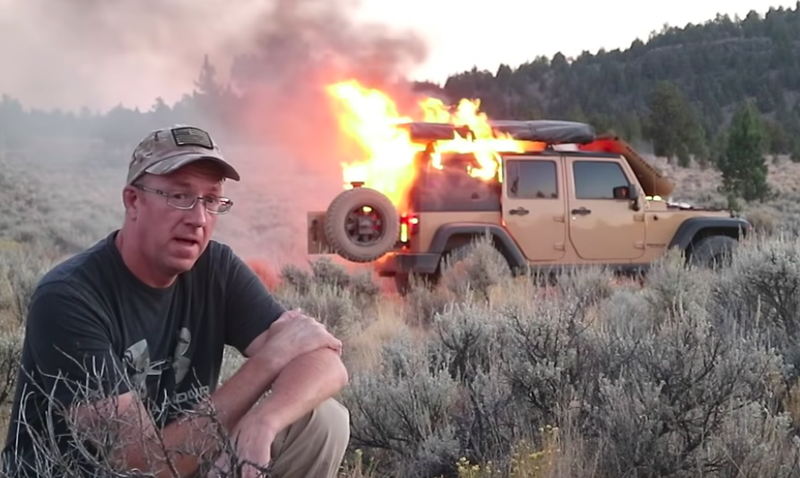 As you can see in the video above titled “The Day My Jeep Rubicon Burns To The Ground,” host of the Coyote Works YouTube channel, Casey Kaiser, was driving down the shoulder of Oregon’s Glass Buttes towards a flat valley when he ran into a dead end, and had to backtrack for a couple of hours. He popped the hood and found that flames appeared to be coming from between the motor and the firewall. So Kaiser sprung into action, grabbed his fire extinguisher and some water, and went to put out the blaze. But sadly, he had no luck; the fire continued burning, especially after making it through the firewall and into the interior. And that’s pretty much what Kaiser ended up doing, though he did have to break out a shovel to throw dirt on flames to prevent them from creating a brush fire—a responsible move on his part. At one point, with darkness having fallen and the Jeep’s fire roaring high into the sky, Kaiser actually looks relaxed, sitting on his camping chair and telling viewers just how good that coconut milk tastes. In the end, Kaiser used his GPS app to show a friend where he was, and by early the next morning, he made it off the trail sans an immolated 2013 Jeep Wrangler Rubicon, which a wrecker picked up five days later. You can watch that recovery here. I sent Kaiser an email to ask about the experience, and whether the vehicle had any modifications. He told me that the only mods were the wheels, tires, rooftop tent, roof rack, fuel/water can mounts, and an awning. So really, nothing much that would logically contribute to the Jeep catching fire. He told me that the fire started out of nowhere after a few hours of low-speed, sub-30 mph driving on some desert two-track roads in four-wheel drive. He did tell me that some folks think dry grass (which the video shows Kaiser driving over a few times) may have gotten caught near the exhaust or catalytic converter. Though he’s not ruling it out as the cause of the fire, Kaiser is doubtful, since he said the flames appeared to be coming from the top rear of the motor. In his follow-up video, Kaiser does imply that a recall was perhaps a player, here. So I checked with the National Highway Traffic Safety Administration, or NHTSA, and found that 2013 model year Wranglers were covered by two recalls related to fires. The first one deals with a power steering tube possibly rubbing a hole into a transmission cooler line. As FCA writes in its owner notification letter, “A loss of transmission fluid could cause transmission damage and if the leaking transmission fluid comes in contact with an ignition source, cause an underbody fire.” But looking at NHTSA remedy instructions, and at forum threads on the topic, the potential transmission line wear point appears to be well ahead of the back of the engine, where Kaiser said his Jeep’s fire appears to have started. The second fire-related recall covering 2013 Wranglers has to do with corrosion in an exterior heated mirror yielding an electrical short—this seems like it’s probably not too relevant in this case. So really, nobody knows at this point why this particular Wrangler decided to char itself. We’ve written about all sorts of cars catching fire for various reasons (and we’ve even written a reminder that cars catch on fire “Like All The Time”) so it’ll be interesting to see what the cause of this ends up being. “FCA vehicles meet or exceed all federal safety mandates. Safety is paramount at FCA. I am unaware of this event, ” Fiat Chrysler spokesperson Eric Mayne told us over the phone when asked for comment.